For its chemical-physical characteristics, the alabaster gypsum is suitable for the production of standard plaster artifacts and durable special artifacts. The large series production is available in our catalogue (in printed form, on CD or on-line, on this website). The company Lagioia Vito snc uses special plasters essential for the production of plaster artifacts subject to particular conditions such as water, heat, shock or stress. Among these, there are TB40 plaster and waterproof exterior plaster. – TB40 plaster: it is a special plaster designed for the production of artifacts subject to shocks and stress, used for the formation of column bases, lesenes, pedestals or very elaborate artifacts like low reliefs, sculptures and light applique, where the presence of particular motives or heat sources such as halogen lamps require to use a special plaster. – Waterproof exterior plaster: the continuous research for new products and the experience of many years of work has led to employ plaster in unthinkable fields; the need to restore externally entire buildings posed the problem of replacing decoration, capitals and frames damaged by time and weather; the necessity of work in the shortest possible time having an optimal result has led to the creation of a special plaster suitable for outdoor use thanks to the addition of waterproof liquid. The manufacturing of modern and classical false ceilings and movable walls has developed depending on the use of several materials (plaster, plasterboard, metal, wood, cement, resin) and according to specific technical requirements for production and installation. Our company Lagioia Vito snc has focused on research and has intervened in many fields to meet any demand from customers. Therefore, the knowledge of all building products to meet different demands has become essential. Here it is the road taken to know two useful elements for modern building such as resin and white cement. Resin is essential for the creation of counter forms for cement pouring and for the creation of external cornices, capitals and decorations on the place (see Receiving Room Ambassador in Foggia). 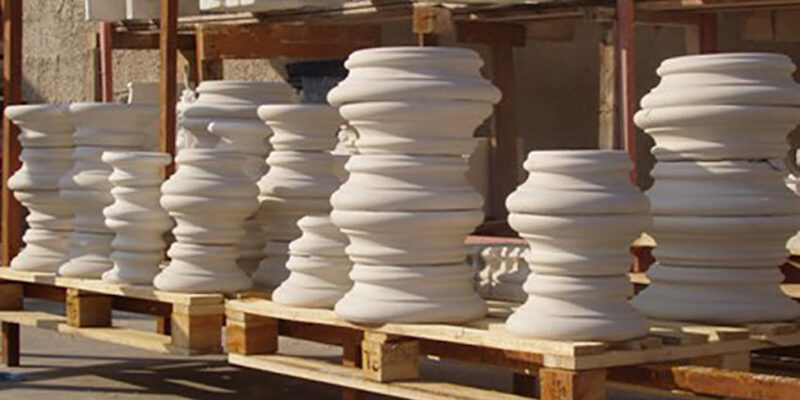 White cement is essential for the creation of columns and balustrades for old buildings (see Palace in Candela – Fg).